The lecture will be given in English. It will take place on Thursday, January 22nd 2009 at 6.30 p.m. at the DIJ. January 22, 2009	/ 6.30 P.M. This presentation shows how two seemingly contradictory concepts about social stratification in contemporary Japan –”fluidization” and “stabilization”– can be understood and explained in a coherent way. A classic example of “fluidization” is an increase in non-regular workers, while that of “stabilization” is an increase in the rigidity of intergenerational social mobility of a particular stratum. We hypothesize that the fluidization has not necessarily occurred at all strata; some strata have still been under the umbrella of protective institutions, while other strata have been being involved in the rapidly increasing fluidity. We argue that this hypothesis is generally supported by examining empirical findings made in the 2005 Social Stratification and Social Mobility Project. In conclusion we consider implications of the co-existence of “stability” of particular parts in social stratification and “fluidization” in the study of social stratification. 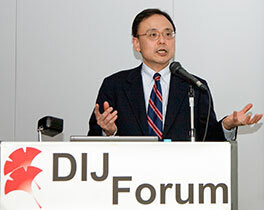 Yoshimichi Sato is professor of sociology at Tohoku University and director of the Center for the Study of Social Stratification and Inequality. His recent publications include Deciphering Stratification and Inequality: Japan and Beyond (Trans Pacific Press) and Game Theory (Shinyo-sha, in Japanese).